No more driving with your fries on your lap, spilling ketchup all over your John Galliano dress. 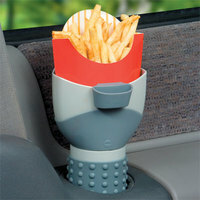 From the wizards of cup holder research comes this dedicated car French–fry holder. "Even has a clip–on ketchup cup!" With that level of attention to detail you know you won't go wrong. "Fits into virtually any size cup holder, with a no–slip rubberized base to help it stay in place." Looks like a 21st–century version of a Duchamp readymade. » Phentermine no prescription. from Phentermine without a prescription. I'm sorry, but I find this rather disturbing. How fat must America get? I think most of us will still manage to drip the ketchup between the cup and the mouth, and get grease and ketchup on the steering wheel. This idea needs more work.